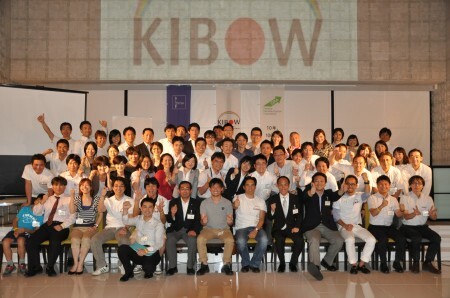 KIBOW-GRA Tokyo was successfully held in Shinagawa with more than 50 participants which was over the capacity. We would like to thank all the people who attended the event. The first part of the event was exciting discussions by tables. The participants introduced themselves and asked questions to Mr.Hirama, Vice Mayor of Yamamoto-cho, Mr.Iwasa of GRA, House of Representatives member Mr.Hashimoto, and Hori, leader of KIBOW and advisor of Yamamoto-cho. The second part was a panel discussion. First, Vice Mayor Hirama introduced Yamamoto-cho with detailed slides, followed by Mr.Iwasa who gave presentation about his activities and what needs to be done for the future of Yamamoto-cho. Just then, Mr. Higashikokubaru, former governor of Miyazaki prefecture and advisor of Yamamoto-cho arrived and answered questions from the floor with his experience as a former governor. At last, Hori gave a speech and took a photo with all the participants. What a nice smile, everyone! 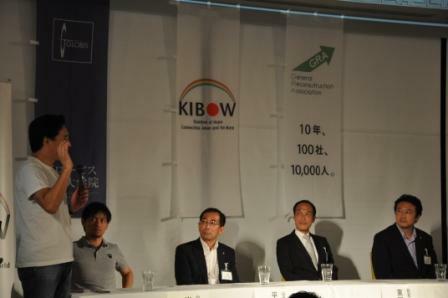 KIBOW will keep on committing to Yamamoto-cho’s “creation” (not reconstruction).